We realize that electronics are an intrinsic aspect of daily life, and USBid supports anyone who designs, fixes or assembles products that use these components. 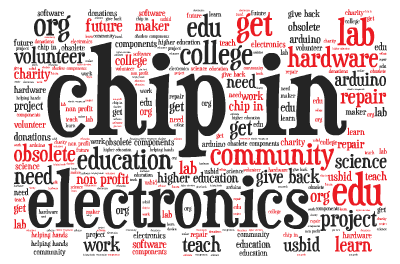 To that end, we want to “CHIP-IN” to help people associated with educational or non-profit organizations. If you are having trouble locating a few pieces of the exact components you need for a repair, or are in need of a sample or two for a special project, we want to help. Most electronic distributors have minimum purchase limits that are too high for some requirements. So depending on part availability and price, look to USBid, and we may be able to help. When submitting an RFQ for a small order, mention the name of your organization and project in the comments box and we’ll try to track the part down – in some cases at no cost to you, depending on your project. USBid specializes in locating all types of electronic components and if we can help repair faulty equipment or complete a breadboard circuit design, we'll certainly do our best to help. Just because it’s small to others, doesn’t mean it’s small to you. It’s our way of getting electronic components in the right hands, where sometimes the need is big even if the order isn't. If we’re able to help and things work out for you GREAT... we don't ask for anything in return. However, if you'd like to express your gratitude please feel free to mention USBid on your website (a link would be great), or in a forum, blog, chat room or favorite social media outlet.